With an attack comprising six international bowlers, Kolkata Knight Riders stamped their authority on Sunrisers Hyderabad to keep them to 142, and then hunted it down with eight wickets in hand. The game was set up by incisive spells from Morne Morkel and Umesh Yadav, who hit good lengths and used the cutters effectively to prise out the top three within the Powerplay. In the chase of 143, Gautam Gambhir struck his 28th IPL fifty, and his second in succession, to help Knight Riders to the target with 10 balls to spare. Sunrisers’ innings began in disastrous fashion after they chose to bat. David Warner, who averaged 63.10 at Rajiv Gandhi International Stadium before this match, miscued a pull to square leg off Morkel, who was playing his first T20 game since August 2015. However, Warner was reprieved as replays showed Morkel overstepped. The luck did not last long, though as Knight Riders chipped away at the top order. The situation got worse when Deepak Hooda holed out to long-on in the 10th over with the score at 50. Gambhir saw a chance and used Sunil Narine, bowling with a remodeled action, in a way he rarely has. Narine bowled four overs in a spell in the middle overs, but did not extract much purchase. Eoin Morgan and Naman Ojha nudged him around, but ensured they laid onto any scoring opportunity. Six boundaries, including two lofted fours over cover from Morgan off Narine, between overs 11 and 15 helped yield 42 in those five overs, setting the platform for a competitive total. As his innings progressed, Morgan transitioned from deft touch to muscular strokes in front of the wicket as he accrued 51, his fourth IPL fifty. It required a moment of athletic brilliance from Andre Russell to remove Ojha. 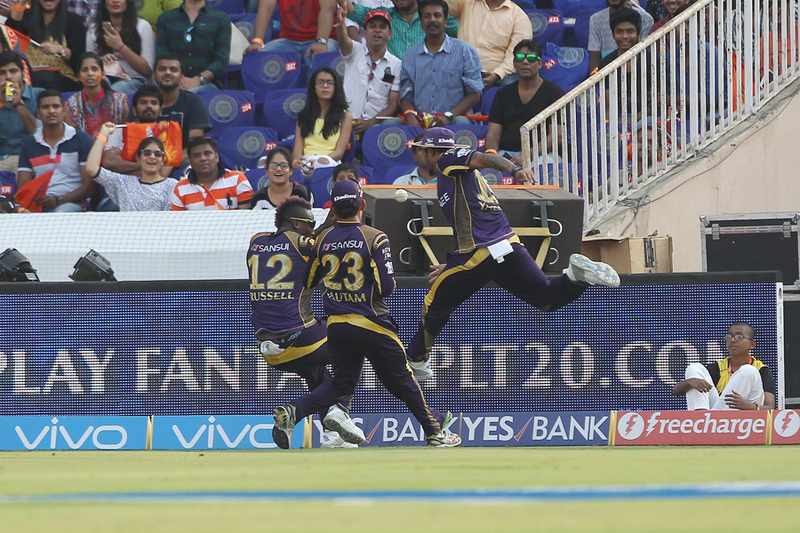 Running around from long-on, Russell held onto a one-handed stunner and parried the ball to Piyush Chawla as his momentum carried him over the boundary. Sunrisers mustered 142, and their bowlers needed a special performance to get close. They did not get it as the Knight Riders openers, Gambhir and Robin Uthappa, made a solid start. In the first ten overs, the pair found a boundary in every over, save two, and hunted down 72 – more than half the target – in that period. Then, Gambhir used swift footwork against Karn Sharma’s legspin for three successive fours in the 11th over to bring the equation down to a run a ball. Sunrisers saw a ray of hope when they took two wickets in the space of eight balls. First, Uthappa was trapped in front by Ashish Reddy and then Russell, promoted to no. 3, was undone by an inch-perfect yorker from Mustafizur Rahman that uprooted the middle and leg stumps. Thereafter, Gambhir struck seven boundaries in a 49-run, third-wicket stand with Manish Pandey to take Knight Riders home in another one-sided encounter in this season.